I remember when I was in my teen years and I thought that my skin would be clear by the time I was 20. I had no idea that I'd still worrying about my skin when I was over 30. Granted, my skin concerns have changed over the years. Combination skin and breakouts have been replaced with dryness, clogged pores and preventing sun damage. Strangely enough, my routine has hardly changed since I was in high school. I wash my face wih a facial cleanser before bed, then moisturize with a face lotion after I shower in the morning. Sometimes I'll use an eye cream to attempt to combat dark circles, but that's never been effective, so I'm inconsistent with it. Now that I'm 32, I've come to realize that I should do more to help my skin as I (gulp!) get older. Overall, I don't have major concerns; I just want to keep wrinkles at bay and try to keep my pores clear. 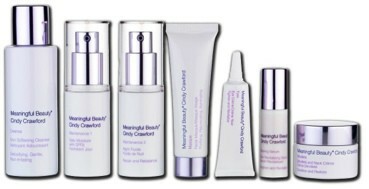 I was recently invited to try out the Meaningful Beauty skincare system for “Advanced Anti-Aging”. It's described as a treatment that combines three powerful ingredients: suuper-antioxidant melon complex, special peptides and hyaluronic acid to protect skin, increase hydration and minimize the appearance of fine lines and wrinkles. I have another post coming up in a few weeks to share the results of switching to a Meaningful Beauty skincare routine. Stay tuned to see how I adjust to using 5-7 brand new products and if my skin likes the change! I wrote this review while participating in a test drive campaign by Mom Central Consulting on behalf Meaningful Beauty and received a 5-step treatment kit to facilitate my review, a second 5-step treatment kit to giveaway, and a promotional item to thank me for taking the time to participate.